GALAXY (2002) The 171 foot cod fishing catcher processor Galaxy caught fire, suffered multiple explosions and was lost October 20, 2002 approximately 30 miles southwest of Saint Paul Island in the Bering Sea. 24 of the 26 crewmembers aboard were rescued by the U S Coast Guard and Good Samaritan vessels Blue Pacific, Glacier Bay and Clipper Express. Weather on scene was 30 to 40 knot winds, 10 to 15 foot seas and freezing spray. First mate Jerry Stephens and cook George Karn were lost. Jose Rodas died as a result of injuries suffered in the disaster. Also lost from the Good Samaritan vessel Clipper Express was Daniel Schmiedt, who was washed overboard by a rogue wave subsequent to the rescue of the Galaxy crewmembers. GEMINI (1980) The 110 foot crab fishing vessel Gemini iced up, rolled over and sank January 15, 1980 in the Gulf of Alaska. Three of her five crewmembers were picked up from a life raft 150 miles southeast of Cold Bay by a U S Coast Guard helicopter from Cold Bay. The Gemini was on her way to safe harbor in Beaver Inlet when the disaster occurred. Lost were captain Roy O’Harrow and crewman Steve Holden. GENERAL (1898) The barge General foundered at sea off of the Aleutian Islands while in tow of the vessel Rival June 2, 1898. The 12 men aboard the barge were rescued by the Rival. Comment: It was reported September 1, 1898 that the schooner Uranus found a wrecked barge on Unimak Island with the word General marked on the bow. Many valuable stores were still on board. GERANIUM (1974) The five year old 11,477 ton Liberian flag freighter Geranium disappeared with all hands in a storm November 24, 1974 approximately 80 miles south of Kiska in the Aleutian Islands. An empty lifeboat and scores of logs were all that was found. 28 Taiwanese crewmembers lost their lives with the vessel. The Geranium was hauling logs and scrap metal from Port Angeles, Washington to Osaka, Japan. GOLDEN VENTURE (1988) The 85 foot trawler Golden Venture capsized while making a turn with her trawl gear down and sank May 30, 1988 seven miles north of Yunaska Island. Captain Rodney Main (44) of Tillamook, Oregon was lost. Three other crewmembers made it to a life raft and were rescued by the fishing vessel Hazel Lorain. GOLDEN VIKING (1983) The 86 foot crab fishing vessel Golden Viking capsized and sank in rough weather September 1, 1983 approximately 9 miles south of Saint Matthew Island. The vessel was making a turn in preparation for setting the first string of pots for opening day of Red King Crab Season when she capsized. Four of her six crewmen escaped in a life raft and were picked up by the fishing vessel Tiffany. Lost were Mike McKee of Seattle and Nick Moe of Newport, Oregon. GRUNION (1942) The 311 foot U S Navy submarine Grunion (SS-216) was reported lost August 16, 1942 in the vicinity of Kiska Harbor. 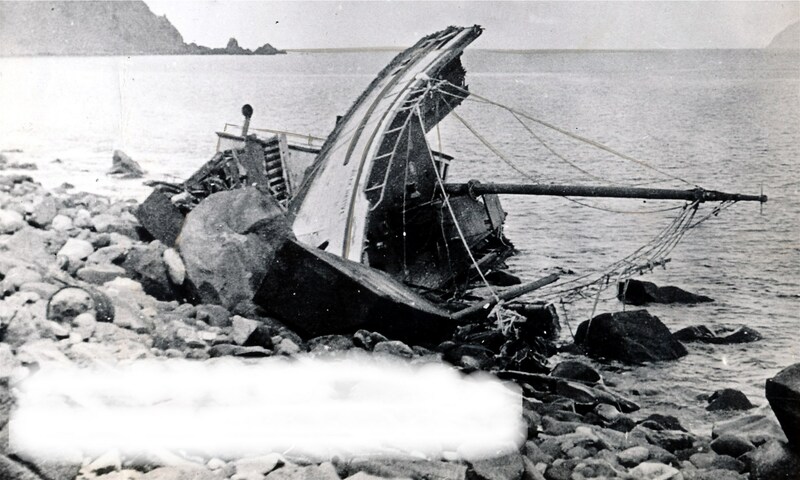 She had severely damaged the Japanese transport ship Kashima Maru on July 31, 1942 northeast of Kiska. Her last transmission relayed that she intended to cover Kiska Harbor. Six officers and 54 enlisted men were likely lost with the Grunion. All those aboard survived, but the Guardian, valued at $12,000 became a total loss. The master of the vessel did not know whether the Guardian had insurance at the time the report was filed.